This proverb works perfectly for the weather we've experienced these past couple days here in Toronto! Yesterday we enjoyed +10 degree (celsius) weather, while today we are shivering in - 4 ("feel like -12") temperatures. This proverb always makes me laugh with it's choice of words ("Marzo pazzerello"), and it amazes me with its truth. After all, that's the fun about proverbs - they are little tidbits of wisdom wrapped up in clever little phrases. This particular proverb serves the purpose of explaining the unpredictable weather in the month of March. 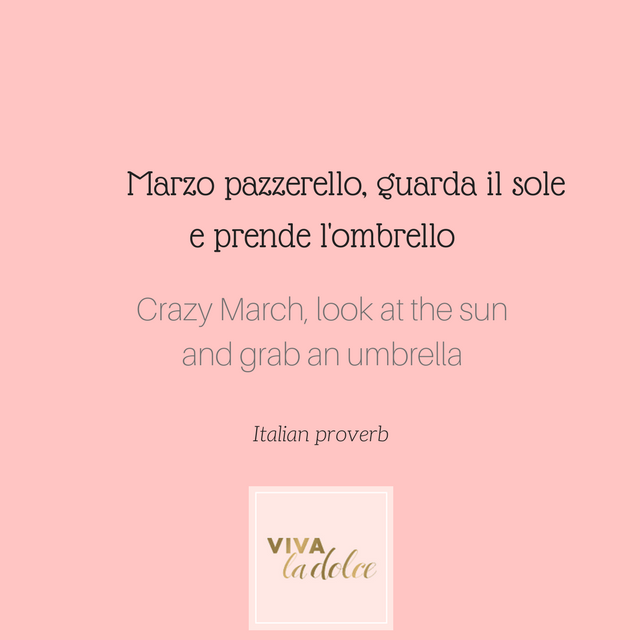 The contradicting statement, "guarda il sole e prende l'ombrello" (look at the sun and grab an umbrella), emphasizes how one cannot trust March weather and should be prepared for anything. March dyes and April paints.